The US responded to Iran's threats that the USS John C Stennis should not return to the Gulf saying US deployment plans remain unchanged. 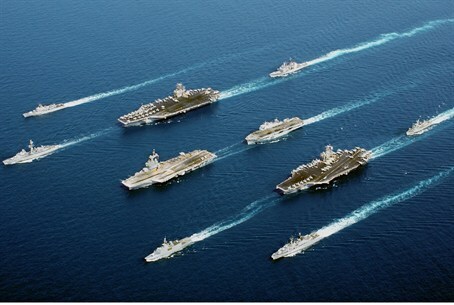 The US military said Tuesday that United States will continue to deploy warships in the Persian Gulf via the Strait of Hormuz after Iran warned a US aircraft carrier not to return to the region. “The deployment of US military assets in the Persian Gulf region will continue as it has for decades,” Pentagon spokesman George Little said in a statement. A US Navy spokesman in an email to reporters on Tuesday said "The United States is committed to ensuring the safe flow of maritime traffic in waterways critical to global commerce." Last week the USS John C. Stennis left the Gulf through the Strait of Hormuz in what the US Navy descibed as "a pre-planned, routine operation." Iran has threatened to respond to Western sanctions over its controversial nuclear program by threatening to close the Strait of Hormuz, through which 40% of the word's oil supplies flow. The Bahrain-based US Fifth Fleet warned Iran in response that any move to close the strait would be regarded as "an act of war." The United States currently has three aircraft carrier groups within striking range of the Strait of Hormuz, as well as elements of the Fifth Fleet still in the Persian Gulf. Military analysts say a direct confrontation between Iran and the United States would likely be swift, painful, and one-sided - in America's favor. The United States faced down a similar challenge from Muammar Qaddafi over the Gulf of Sidre in 1986. In addition to the asymmetrical strategic and logistical advantage the US possesses over Iran, it would likely be joined by its Gulf allies - who would provide forward airbases for additional US air and missile forces to operate from. Increased tensions in the Strait of Hormuz comes as officials in Jerusalem and Washington wrangle over triggers for a strike on Iran's nuclear facilities. Should Iran miscalculate American will to act and force a confrontation over the passage of US naval vessels into the Persisian Gulf its nuclear program could be in the crosshairs. Amid new US sanctions Iran's currency slumped to a record low against the US dollar on Monday, two days after US President Barack Obama signed the sanctions into law. The step is part of a push to hamper Iran's ability to finance its nuclear and missile programs. The United States and its Western allies say Iran is secretly trying to develop nuclear weapons under the guise of its civilian nuclear program - a charge supported by the International Atomic Energy Agency.